Day 2 of Eat Your Fruits and Vegetables Week is here. Dun dun dunnn. I haven't mastered the layering technique for this sandwich quite yet. Apparently it is more important for it to look pretty than to ensure that it doesn't fall apart in your hands. C'est la vie. This sandwich is sometimes called a 'California' or something to that effect. You can always add a little turkey or roast beef if you are in the mood for it. I like the taste of the veggies by themselves so I don't add any meats. PS - The day I made this, I ate it for breakfast. I make no apologies. Ready for the recipe? 1. 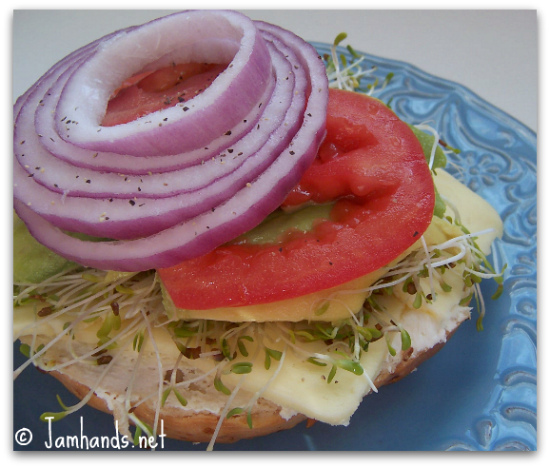 Layer all sandwich filling ingredients on top of a fresh bagel or foccacia bread. Eat and be happy. Looks yummy, thanks for sharing. squeeee! LOVE veg sandwiches more than anything! I love veggie sandwiches and eat them all the time! Yours looks awesome and sure was a healthy breakfast. I love cheese and veggie sandwiches! In fact, my favorite sandwich of all time is cheddar and veg on rye.